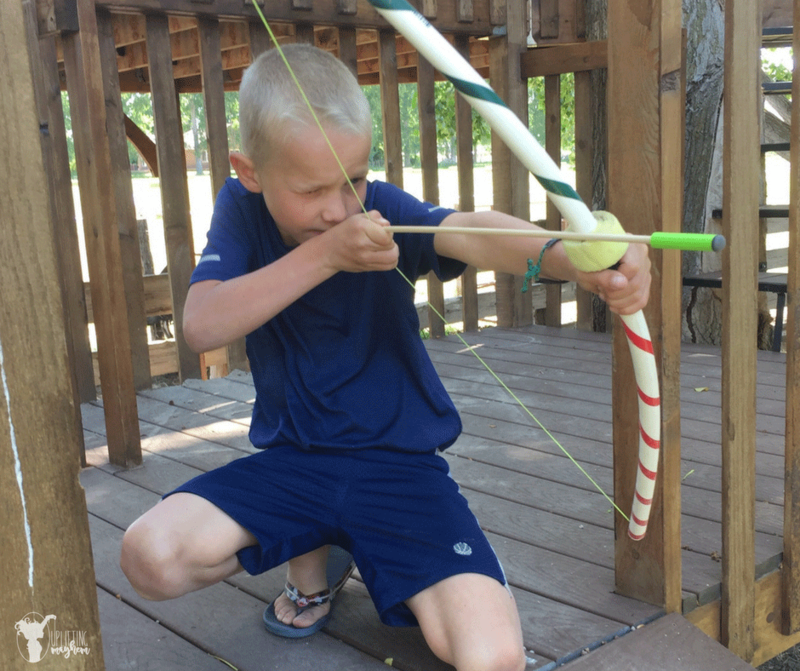 These kid’s bow and arrows are really easy and surprisingly shoot really well! 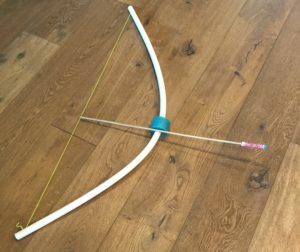 The arrows aren’t super heavy so they don’t fly straight like an arrow, but it serves the purpose. Lots of fun long hours put into these bows. I made about 20 of these for a family reunion, and the kids love them! I made them targets to shoot at, and the boys carried them around on their backs all day! First take your PVC pipe that is 4 feet long and cut, either with a hand saw or a band saw, a slit on each end of the pipe. Make the slit about an inch long. 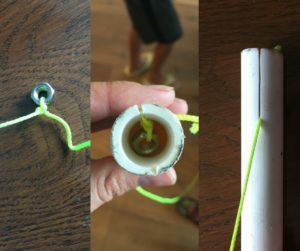 Cut your string the length of your PVC pipe and tie a small nut onto one end of the string. 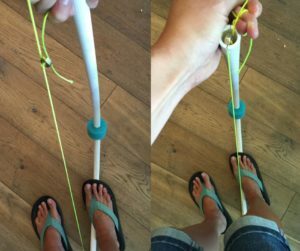 Place the nut and string in the PVC and pull the string down the one inch slit you made. The nut will hold it in place. 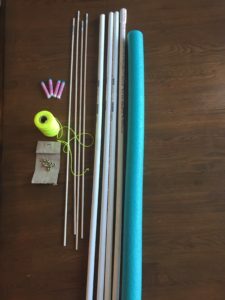 Cut a 2 inch section from the pool noodle and slide it on the PVC pipe. 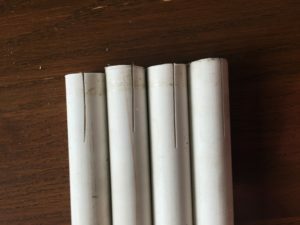 Insert your nut and string into the PVC pipe slot you made. This part is a little tricky but is easy if you do it right. 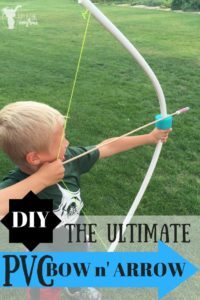 Get your other end of the string in one hand and the PVC pipe in the other. Step on the bottom of the PVC pipe with your foot and push down with your hand as well to bend the pipe. I bent mine pretty far and it never snapped. Once it is bent, slide the string and nut into the slit you made. Cut the 1/4 inch dowel down to 2 feet in length. 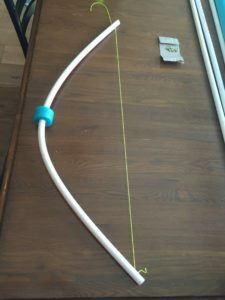 Get your nerf dart, place a drop of hot glue down it and slide it on the dowel. You can now decorate it with tape. I used this kind of tape. On the 20 I made I did the same design on the bow and arrow so it matched! Then kids weren’t fighting over who’s arrow was who’s! Worked Great! Kids have a lot of fun and they last quite a long time! ENJOY AND HAVE FUN!! I made these for a family reunion 3 years ago and they are still a HUGE hit for all of the grandkids! They seriously LOVE them! All the boys and girls lived in the haystack shooting at the hay bales! Super fun! I wanted to update a little change we made on these bad boys. The arrow rest, made out of a pool noodle, kept breaking off and ripping, so my brother and I improvised. I liked it enough to pass it along to you! 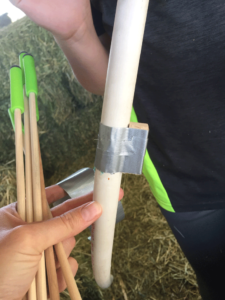 Instead of using a pool noodle, we just got a piece of wood and duck taped it to the side of the bow. 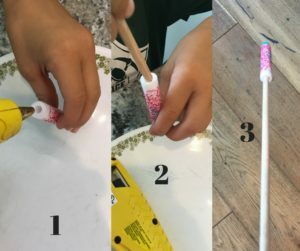 It worked great and the kids really like it! Here is a picture of it to help you visualize the change. For another DIY Summer activity, check out this DIY Water Weenie Squirt Gun!! Super fun!